In an important contribution to modern US government and policy studies, Hogan (History/Ohio State Univ.) 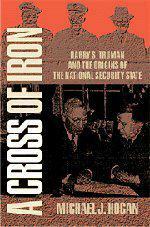 traces the development of America’s national security apparatus in the first decade of the Cold War. For much of its history, the US took to heart the advice of George Washington to avoid entangling alliances and involvement in foreign affairs. Accordingly, as it matured, America pursued a policy of nonintervention in foreign wars (except in Latin America), and enjoyed an antistatist and antimilitarist domestic culture. While America was becoming an active international power in the years prior to WWII, isolationism still characterized American policy on the eve of that war. The Japanese attack on Pearl Harbor transformed the domestic policy consensus: isolationism was no longer viewed as a practical policy, and America had to bear the burden of its own defense. Hogan argues that, in the first decade following the conclusion of WWII, advocates of the new ideology of military security came into conflict with proponents of the older values. He contends that the emerging national security state was largely the presidential creation of Harry Truman, who attempted to reconcile the two camps, and of Dwight Eisenhower, who feared the development of a garrison state but recognized the need to end the isolationist policy of the past. The tension between the two ideologies could play out within the same individual, as was the case with Truman and some others. Often, the tension carved out divisions along party and institutional lines (the national security ideology was associated more with the Democratic party and the executive branch, and the older culture more with the Republican party and the Congress). What resulted, Hogan concludes, was a compromise: while the political, military, and intelligence organs of the national security state proliferated, the nation’s democratic values and principles of civilian control prevented the nation from becoming a total garrison state. An absorbing, provocative study.